Maisie Williams: "I had a taste of that sort of fame with this show and I made a vow to myself: I do not want that." Game of Thrones star Maisie Williams says she isn't ''interested'' in fame and won't be complaining if the popular HBO show is the biggest thing she will ever do in her life. 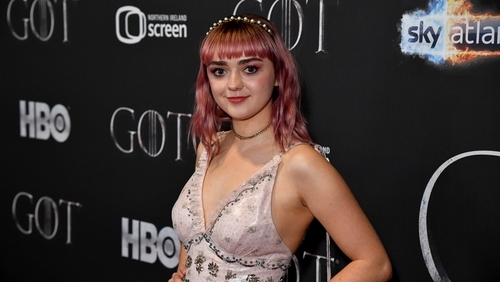 The 21-year-old actress, who plays Arya Stark in the hit fantasy series, admits he wants to enjoy her life out of the spotlight as much as she can. Speaking to The Observer, she said: ''I still see ignorant comments feel like I personally have to remove myself, because I had a taste of that sort of fame with this show and I made a vow to myself: I do not want that. Game of Thrones is about to air its final series and Williams has revealed she is enjoying time away from the busy set. "I've had a chance to just live my life rather than living my life in front of people, and then telling them about it, you know? I feel like that's basically how I spent my adolescence. The cast recently lit up the red carpet in Belfast for the first episode from the final season of the show that all began in Northern Ireland ten years ago.